Seventy years ago, on 9 October, 1937, US bush pilot James Crawford Angel, better known as Jimmie, carefully positioned his Flamingo monoplane "El Rio Caroni" for a landing on top of the vast heart-shaped mesa mountain Auyan-tepui in Venezuela's isolated Gran Sabana region. According to Jimmie's later accounts, the plan was to stay a few days and search for gold, But in such a wild and distant region of Venezuela plans seldom run smoothly. When the plane hit a soft spot on the tepuy during the landing it nosed-up, damaging the fuel line. The accident left Jimmie, his wife Marie, fellow explorer Gustavo Heny and Miguel Delgado, Heny's gardener, unharmed but they were now stranded atop Auyan-tepui. The only way down was on foot, across unmapped terrain and with limited supplies. Eleven days later, exhausted but alive, the party reached Kamarata on the other side of the tepuy. As news of their adventure spread Jimmie Angel's name became inextricably linked with the waterfall that he had first seen in 1933: Angel Falls, the highest waterfall in the world and Venezuela's greatest natural treasure. Jimmie Angel and his exploits have since become the stuff of legend for anybody visiting Venezuela. His plane may have been taken down from the top of Auyan-tepui but it still stands outside Ciudad Bolivar airport, where modern-day tourists start their trips to Angel Falls. So who was Jimmie Angel? To try and get at the truth behind the legend, I spoke to Karen Angel, Jimmie's niece, who has been tracking down the truth about his exploits for the Jimmie Angel Historical Project, a not-for-profit organization she runs from the United States. Q: Jimmie and his passengers had been planning the landing near the falls for a long time and had brought a lot of supplies. Heny and Catalan explorer Felix Cardona Puig had even scouted routes up Auyan-tepui from Guayaraca, near Kamarata, the route the party used to get down. Was the crash-landing a publicity stunt to get Jimmie's name on the map as some have suggested? 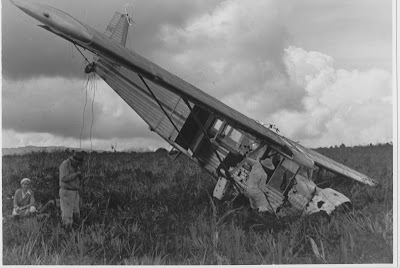 Jimmie Angel loved his airplane "El Rio Caroni". He would never have intentionally harmed it. He also had an important job coming up with the American Museum of Natural History and was to be the pilot-guide for the 1938-1939 Phelps’ Venezuelan Expedition to Auyan-tepui. Losing his plane on the mountain meant he could not do the AMNH job. So it was a big hardship. Jimmie didn't have extra money tucked away for a rainy day. He and Marie had to leave Venezuela in 1937 to obtain a new plane and did not return until 1938. Q: But why would he take his wife with him? Surely it was dangerous? Marie loved being with Jimmie on his adventures. She acted as his navigator. They were very much in love and she was very devoted to him. She only went back to the USA later because the two children became ill with malaria. Both his wives, Virginia his first wife and Marie, were good-looking redheads who loved adventure. Q: And all those preparations beforehand? Jimmie definitely thought the river of gold was up there. He also knew that bush pilots who didn't prepare didn't make it back home. And Jimmie was a very good bush pilot. Q: How famous was he in his lifetime? He wasn't that well known in the United States but he was very famous in South America. Ornithologist Thomas E. Gilliard's articles about him in the Saturday Evening Post and the Natural History magazine in the United States spread his story. And Ruth Robertson's 1949 article for National Geographic was important, because it proved Angel Falls was the highest waterfall in the world. Q: What's your interest in Jimmie Angel? This is my family story, if you like. My father Clyde Marshall was Jimmie's youngest brother and I just felt people should know more about him. Not just the legends that he helped to create but the facts. I'm more interested in Jimmie's work with the scientific teams that explored the Gran sabana region, such as paleontologist G. Gaylord Simpson and Gilliard, than the "the river of gold" stories that everybody always asks about. In 1994 I decided it was time I went to Venezuela and saw Auyan-tepui and the falls for myself so I signed up for a tour. I met so many people who had heard of Jimmie Angel but there was so little accurate information that I felt I should do something to set the story straight, to fill in the gaps and give a more rounded picture of the man. In 1996 I started the Jimmie Angel Historical Project and commenced doing research by interviewing people who knew him and explored the archives that contained information about him. Q: Have you climbed Auyan-tepui? Yes, in 1994. I have also been to the base of the waterfall by canoe twice, in 1994 and 2002. But it wasn't just the falls I wanted to see. Jimmie was really close to the Pemon people of the area and he and Marie adopted a young child called Jose Manuel Ugarte. I didn't expect to find him but he was in Kamarata when I arrived in 1994. He was 78 years old and was building a house for one of his sons. He had six children. I also met my two "cousins" Santo and Nered Ugarte in 2002 which was really special. Q: But did Jimmie really meet an old gold prospector called McCracken in a Panama City bar in 1924 and fly with him to flat-topped mountain in Venezuela where they extracted 60 pounds of gold from a riverbed in a few days? Did you say 1924? I heard the year was 1921. Anyway, I can't substantiate that he did meet this prospector, but I can't say that he didn't. Jimmie did embellish his stories throughout his life as he looked for investors willing to finance his expeditions, because that left him free to seek out his El Dorado. So part of it was marketing. But even if you strip away the legendary stories of fighting with Lawrence of Arabia or meeting McCracken, you still have a man who lived an extraordinarily adventurous life, who fully enjoyed what he did and was a devoted father loved by his family. Q: He seems like a larger than life character. There's something very Humphrey Bogart about him in the photos. Why has there never been a Jimmie Angel movie? He was very charismatic and women loved him. Most people know him from the photos taken at the end of his life but he was very handsome when he was young. There are many movie scripts out there but they've never been made. Even when he was alive there were movie projects about his life. I think there will be one someday. It's just such a great story and Auyantepuy, the Gran Sabana and Angel Falls are such a great backdrop for a movie. Yes. Jimmie Angel died in Panama in 1956, aged 57, but in July 1960 his widow, Marie and his two sons Jimmy and Rolan, with Gustavo Heny and his friend Patricia Grant, flew over Angel Falls and scattered his ashes. Grant wrote afterwards: "As we skimmed by the Falls the ashes floated downward whipped by the wind and mixed in the spray, and thus our beloved Jimmie returned to his waterfall." I think his name will live forever. If he'd been named Jimmie Smith it would be a different story but Angel just seems right for such a special place. The photos for this article, apart from the photo of the Rio Caroni outside Ciudad Bolivar Airport which is mine, come courtesy of the Jimmie Angel Historical Project. The top photo was taken by Gustavo Heny and is part of the ©2006 Jimmie Angel Historical Project in association with the Enrique Lucca Collection. Click on the photos to make them larger. My father was a good friend of Jimmy Angel's in British Guiana after the war. Jimmy always stayed at our hotel when he flew into Georgetown and I remember him being there. I also remember listening in on huge poker games where the stakes were raw diamonds in the thousands of dollars. I have a photograph of my father Bill Leslie and Jimmy Angel at this time. I also have a book, A Young Man's Journey, by Nicholas Guppy (the fish was named by his grandfather)where he is introduced to Jimmy Angel by my father in Leslie's Bar in our hotel. Guppy tells a hilarious story of going out on the town with Jimmy. I'd also be interested in seeing Nicholas Guppy's account of his night on the tiles with Jimmie Angel. I bet that was a night to remember!